What is a “stewardship revolution”? A revolution in giving comes from renewed stewardship commitment by a leadership team filled with people whose hearts and lives reflect financially-dedicated discipleship. Pastors and committee chairs must courageously insist that all who seek to be leaders demonstrate their faith as stewards (11-12). Be prepared for some pushback, but stay steady. As Scott McKenzie explains, “Jesus didn’t go running after the rich young man… [or] say ‘Wait, I didn’t really mean all that stuff about giving.’ Jesus let him go” (16). McKenzie provides step-by-step guidance to make serious changes for the better. Church leaders should increase expectations of themselves and others to result in rising generosity now and in the future. The goal is enthusiastic support for your church’s ministries through giving. Key strategies include implementing a “Generosity Boot Camp” or retreat for church leaders and staff (23-42). Together, this group will create a “Generosity Declaration” for the church. They should display it on a banner and invite people to sign on during worship as the culmination of a four-week generosity campaign (40-42). A “21-Day Challenge” daily devotional is included, with permission for you to use or adapt for your context (89-117). McKenzie provides guidance about ways to move beyond secrecy about who is on “the giving list” and open up healthy conversations about money (14-18). He offers inspiring ideas in a detailed “Yearlong Plan” for stewardship (65-84). Churches should continuously educate and engage children and youth in various forms of giving (20). McKenzie knows the importance of contributions of all ages and suggests a visible witness through creating a display of individual “gratitude cards” on which people write or draw what they are most thankful for (83). 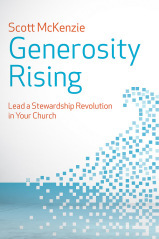 Generosity Rising is a guidebook that provides coaching for more effective stewardship. McKenzie presents sound advice and resources from his two decades of experience as a stewardship consultant, including his current work with Horizons Stewardship. Many churches have benefitted from his previous books, co-authored with Kristine Miller: Bounty: Ten Ways to Increase Giving at Your Church and Climb Higher: Reaching New Heights in Giving and Discipleship. Contemporary examples from committee chairs, pastors, and church members ring true. McKenzie discusses what doesn’t work and why in the typical stewardship efforts that maintain the status quo, but have become increasingly less effective today. Most important, he understands what measures to take to bring lasting change for increased financial health and energy to fulfill your church’s mission.